I dutifully chopped and simmered my quinces. The house should have been overtaken by their fragrance; it wasn't. When I strained them and sampled the juice, it tasted like a slightly sweet weak vegetable broth. (I confess to committing a cardinal infraction: I'd neglected to smell what looked like perfectly ripe quinces. As a rule, I smell everything when it comes to cooking – ingredients, equipment, storage containers. It's a good habit to get into; you can spare yourself a lot of Food Gone Wrong.) I googled around for some kind of explanation and turned up a lot of interesting information on quinces, but nothing to account for their blandness. Who knows – maybe they were grown in unfavorable conditions? Stored badly? Hexed? 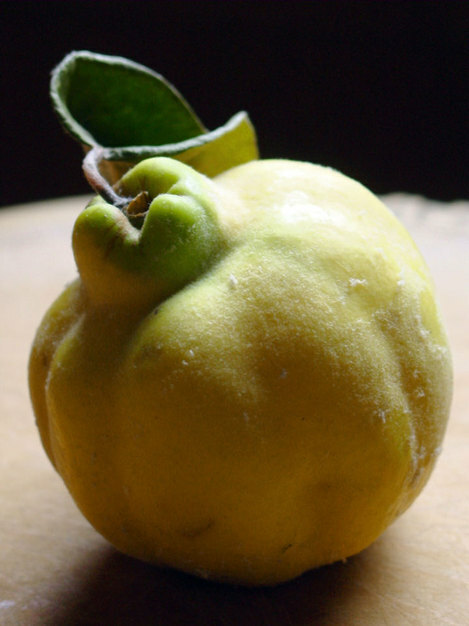 As I made the rounds of the food blogosphere, I seemed to find quince posts nearly everywhere I clicked (given that it's the season for quinces, it's hardly surprising). Here's Elise Bauer on Membrillo. And Eat Drink One Woman on Quince-Pear Butter. And The Cottage Smallholder on Quince Jelly. And Tartellette on Quince Tartlets. And so on. Now I was determined to get more quinces. Good ones. There's a terrific orchard over in Walpole, New Hampshire, about 40 miles from here. Alyson's grows a vast selection of fruits, including several rare heirloom apples. I'd gotten some lovely peaches there back in August (from which I made sun-cooked peach butter...“summer in a jar” is how its fans describe it), and I figured that it was a safe bet they'd be growing quinces. According to their website, anyway, they were, so I placed a call to the orchard office and spoke with the orchard manager, Homer. He confirmed that there were quinces available, and even offered that he had seconds, cheap, if I didn't mind some dents and scratches. The following day found me toodling off to Walpole. I don't know how it happened, but Walpole has become a sort of nexus of culinary excellence. In addition to Alyson's, this little hamlet is also the home of L.A. Burdick's chocolate shop and café, Walpole Creamery (“Home-Grown Premium Ice Cream”), and the Walpole Grocery (an impeccable little fine food emporium). I never need much of an excuse to head over that way (and on this particular day, I did stop into Burdick's for a tiny fruit tart and an espresso). At Alyson's, Homer pointed me to several crates full of perfectly ripe, but slightly bruised, quinces and told me to take what I liked. I loaded up a large cardboard carton (25 lbs.!) for which Homer charged me a whopping $5. I also poked into the farmstand and picked up a half-peck each of Black Oxford and Esopus Spitzenberg apples (for more of Mr. Mora's apple pies). It was a few days before I could get to processing all that fruit; I left the box in my car to avoid introducing any more fruit flies into the house – they've been horrendous this year on account of the late onset of cold weather. I figured the quinces might ripen a little more, and as a bonus they'd leave my car sweetly perfumed (nearly a week later, the quinces long removed, the car still smells heavenly). Several of the articles I found on quinces made mention of their use as an air freshener. Their dry flesh means they're not prone to rot; a lone quince tucked into a linen closet, left on a bureau, or even stashed in your car's glove compartment, will last for months, slowly drying out but perfuming the air in the process. Silly me, I didn't save any. This tidbit quite impressed me: the origin of the word “marmalade” is the Portuguese marmelada, a thick jam made from quinces (marmelo, in Portuguese). It appears that the English appropriated the use of the word for citrus jams some time in the 17th century. I was also impressed – in a hopping mad kind of way – by this dimwitted recipe for quince jelly, which calls for added liquid pectin. Given that quince have one of the highest pectin contents of any fruit, that's just inexcusable. I eschew the use of commercial pectin in any of my jams and preserves, preferring to skip over recipes that call for it. I just don't like the way it performs – the liquid stuff is either too slimy or gummy and the powdered stuff is too cloudy. Last year I made a hot pepper jelly by cooking down crabapples (also very high in pectin) and using their juice as the basis for the jelly. It was delicious, and had a nice, soft, natural set. Where was I? Oh, yes...processing the fruit. Nothing earth-shattering. I got 16 quarts of a beautiful clear orangey-pink juice from them. I'm waiting on delivery of a fresh order of jars; the juice can wait in the fridge until I have jars and time to make jelly and can it. There are recipes for quince jelly all over the web if you want to try for yourself (just avoid any that would have you add pectin!). I've always felt guilty about throwing away (composting, actually) the fruit pulp when I make jelly. I had so much quince pulp, and it was such a lovely color and smelled so good. I decided to try and make a kind of quince liqueur. I imagined something warm and spicy – and strong. A midwinter balm...a holiday elixir. I took two 3-liter jars and loaded each a little more than half full with pulp. Then I added (to each) a quart of vodka, a cup of cognac, a cup of sugar, 4 cloves, a generous grating of nutmeg (1 tsp.? ), and the peel from two small Meyer lemons. On initial tasting, it seemed a little sweet, but I imagine it will mellow as it matures. 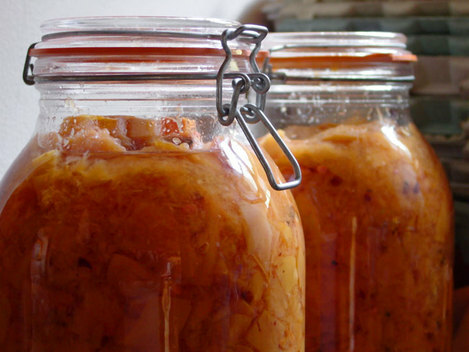 I've tucked the two jars into the pantry, and every day I give them a few gentle end-over-end turns. I expect I'll leave them brewing until the hols, but don't expect me to resist sampling from time to time. "A cup of arsenic, a spider, some glue / A lizard's gizzard, an eel's ear or two" Yer always brewing up something aren't you? The quince liqueur does sound yummy even if it looks likes something my cat hocked-up on the carpet. This is such a lovely, evocative post, GG. Makes we want to run out and hunt up some quinces pronto. I love the warmth evoked here-I can't wait to try my jar and am sorry that I won't be around to sample the elixir.